Queen Elizabeth I(right) ruled England in the 16th century.She succeeded her father King Henry VIII, her half-brother King Edward VI and her half -sister Queen Mary I who ruled before her. Between them, her two predecessors King Henry VIII and King Edward VI had completely destroyed the Pound by debasing it till there was very little silver left in it. 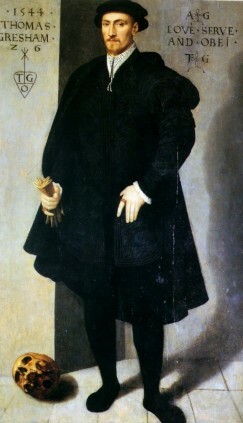 Queen Elizabeth,who was very ambitious for England was hampered by a weak Pound so she sought the help of Sir Thomas Gresham(left),a merchant,to solve the problem.